Tis Pumpkin Season! My favorite time of year. With the days becoming shorter, cooler and the moon more intense, there is a feeling of change. Although I have to admit that – I do not miss leaf raking , I do miss seeing the fields of pumpkins in Kansas. All colors, shapes and sizes. After seeing a photo of my granddaughter on a big blue pumpkins in a field of “blues” I could not stop thinking of those fond memories. 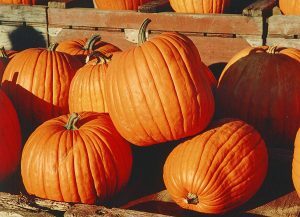 As for the seasonal pumpkin, it’s one of my favorite foods. Baked, roasted, mashed or in soup. Then of course, there’s the traditional pumpkin pie and the seeds! Here’s a video that I discovered on NPR that I hope you like.